Please consider supporting this pro-life movie! Film Description: Abby Johnson becomes the youngest clinic director in the history of Planned Parenthood, then a life-changing experience turns her into an anti-abortion activist. Fifty-four million (54,000,000) babies have been tragically killed by abortion in the USA since the tragic Roe v Wade Supreme Court decision passed down in 1973 – 3,400 babies per day. Sometimes we hear so many statistics in a day that we become immune to them- desensitized to what they really mean. 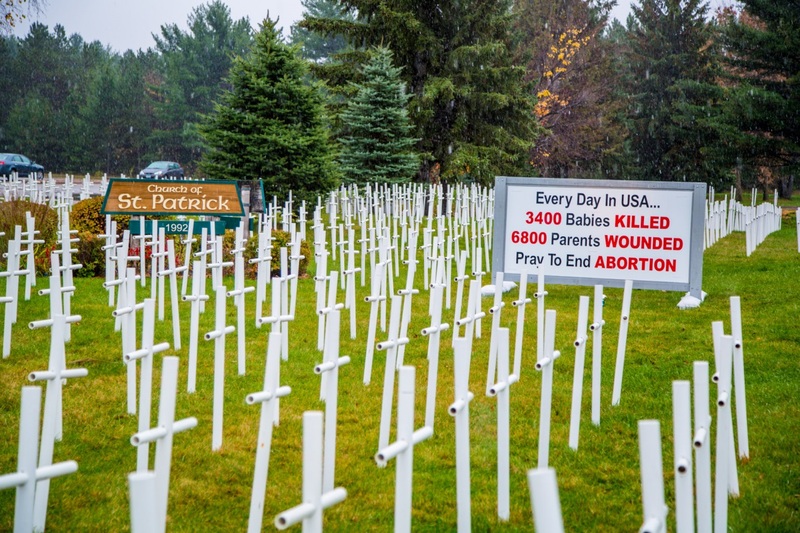 However 3,400 babies killed every day must not be just a number and must not be invisible. We must understand it, be alarmed and outraged by it, and be moved to greater action to halt it. 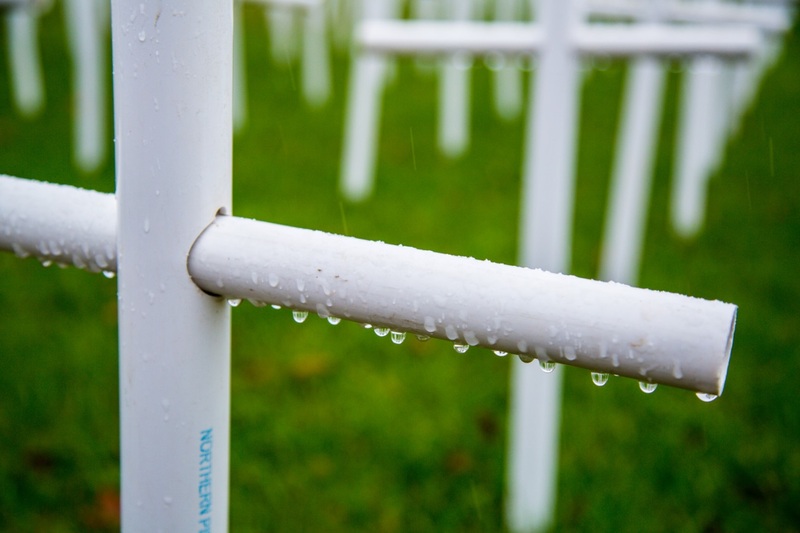 To help all of us in our parish and community truly understand what this means in a very real way, St. Patrick’s Life Matters committee has constructed a memorial to these fallen innocents. 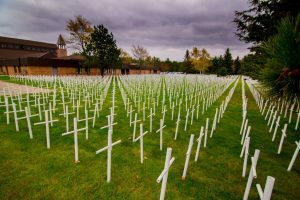 One day’s worth of abortions committed in our nation – 3,400 little white crosses to represent the little lives that will never be born to make a difference in this world. The harsh reality is that every day a cemetery for aborted babies like this could be constructed in this country. One wonders if that kind of visual would awaken those who still think abortion is a “choice”. 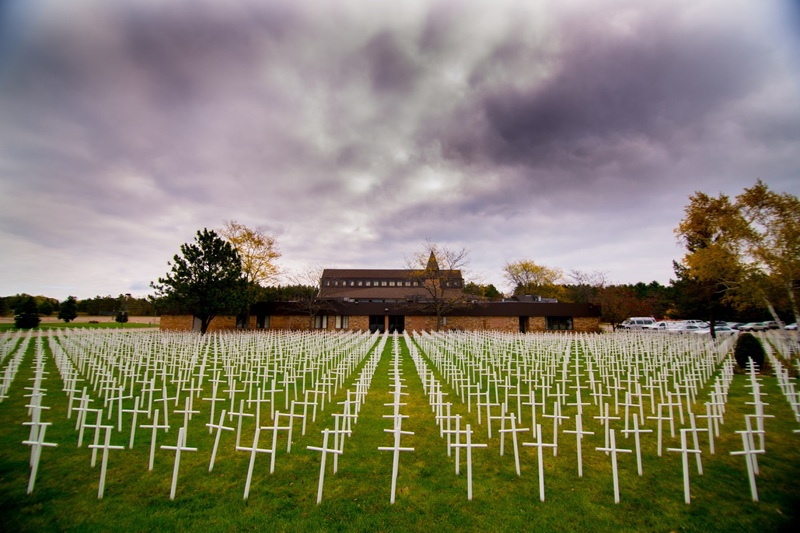 Before we began construction of our memorial we asked alumni members of the Rachel’s Vineyard Retreat for post abortive women and men for their reaction to the Cemetery of the Innocents to remember the babies – including their own aborted children. The devastation of abortion extends beyond the innocent babies and greatly wounds mothers, fathers, families and society in general. Would they feel offended? Would it be too painful? Without hesitation they were overwhelmingly supportive of such a display to remind everyone that these are human beings – little people- who are dying. And it was the Rachel’s Vineyard alumni who came up with the name for our sign. Every day In the USA. 3400 Babies Killed and 6800 Parents Wounded. The mission of the Life Matters ministry at the Church of St. Patrick is to help our parish be a center of life—a parish of people who understand important contemporary life issues and who recognize the rights and needs of those among us who are most vulnerable, particularly mothers and their unborn children. Life Matters is committed to promoting a renewed respect for Human Life from conception to natural death. We do this through prayer, education, and participation in activities that promote reverence for life. Life Matters educational activities include our annual Respect Life Weekend in October, Spiritual Adoption, March for Life, rosary prayer for an end to abortion, and distribution of information on important legislation regarding life issues. Come and join our Life Matters ministry and help spread the Good News about the precious gift of Life! Members of the Life Matters ministry meet on a monthly basis. The committee assists the bishops in teaching respect or all human life from conception to natural death. We organize education and prayer here at St. Patrick’s for all Human life protection, especially on behalf of those who are unborn, disabled, elderly, dying, or facing the death penalty.